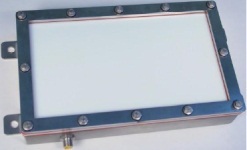 This 4” by 8” backlight, designed for washdown environments, is IP68 compliant. Its enclosure is constructed of 316 stainless steel, with a FDA compliant silicone rubber gasket. This light has been hydrostatic tested. The built-in strobe controller may be connected directly to 24 VDC power. We recommend strobing this light to achieve maximum LED life, especially in warm environments. A 4-meter washdown cable is included. Window: White Diffuser Window options: polarizer.